Going back to October 2004, the SEC has won against at least four of five defendants in front of its own judges every fiscal year. The SEC says its judges are impartial and the process is fair. It attributes the difference in outcomes partly to case mix. For instance, most of its complicated insider-trading cases have been heard in federal court, not by its in-house judges. The Journal analysis also reveals the SEC’s high success rate in appeals of its administrative law judges’ rulings—the appeals its own commissioners hear. The commissioners decided in their own agency’s favor concerning 53 out of 56 defendants in appeals—or 95%—from January 2010 through this past March, the Journal found. Five other cases were sent back to in-house SEC judges to reconsider. Defendants who appealed risked making their situations even worse. During the same stretch, the SEC commissioners reduced financial sanctions imposed on one defendant but increased the sanctions for seven others. SEC officials believe appeals within the agency aren’t as one-sided as the Journal’s analysis suggests, according to people close to the agency. Several appeals involved cases where the underlying conduct wasn’t in dispute, such as appeals of industry bans. 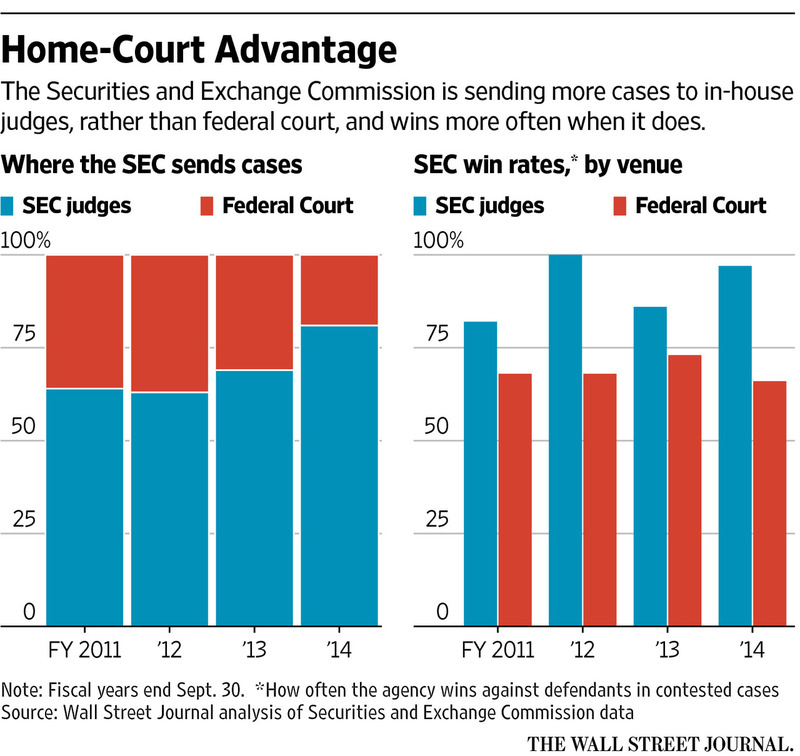 Stripping those out, the SEC decided appeals in its own favor 88% of the time, rather than 95%. For comparison, U.S. attorneys had an average win rate of 84% before federal appellate courts in the past three fiscal years, according to Justice Department data. That rate applies to criminal cases, in contrast to the SEC’s civil cases. The SEC brought more than four out of five of its enforcement actions as administrative proceedings, rather than federal-court cases, in the fiscal year ended Sept. 30. That was up from less than half of them a decade earlier. While many such cases are settled by agreement with defendants or address straightforward matters, SEC officials say they also are sending increasing numbers of contested lawsuits to their own judges, reflecting enhanced powers granted by the 2010 Dodd-Frank financial legislation. The law allowed the SEC to seek financial penalties in administrative proceedings from firms and people not under its regulatory purview. Still, no defendant has escaped unscathed before SEC Judge Cameron Elliot, the judge who heard Mr. Shapiro’s case. In Mr. Elliot’s four years as an SEC judge, he has found all of the 28 defendants who came before him in contested cases liable on at least some of the charges the SEC enforcement arm had brought against them. This compares to an 85% SEC win rate in cases before another in-house judge, Carol Foelak, and 87% in cases heard by the agency’s chief administrative law judge, Brenda Murray. A spokeswoman for the SEC judges declined to comment, and the judges declined to be interviewed. The judges have their offices on the second floor of SEC headquarters in Washington, along with the agency’s press office and a staff health club, according to people close to the agency. John Flannery and James Hopkins say their encounter with the SEC has cast a long shadow on their lives. In a closely watched case, the two former executives of investment adviser State Street Corp. beat the odds by winning before SEC chief judge Murray, only to have the SEC commissioners partially reverse her ruling three years later. The agency in 2010 charged that before the financial crisis, Messrs. Flannery and Hopkins misled fund investors about exposure to subprime bonds. State Street, which paid more than $300 million to settle related charges without admitting wrongdoing, declined to comment. “What they alleged was such an assault on my integrity and ethics,” said Mr. Flannery, a former State Street chief investment officer. The SEC’s enforcement staff appealed the SEC judge’s rejection of charges against the two. They then had to wait more than three years for the SEC commissioners to decide the appeal. “The SEC says the process is streamlined, but that’s not true if there’s an appeal,” said Mr. Hopkins, who had been a product engineer at State Street. He said he hasn’t worked since the charges were filed more than four years ago. Firms overseen by the SEC appear wary of employing someone in a dispute with it, he said. “Even though their chief judge said I’ve done nothing wrong, they’ve still put me in a box. They’re punishing me by keeping me out of a career I love and I’ve spent 35 years in,” Mr. Hopkins said. In December 2014, the SEC commissioners, in a 3-2 vote, agreed with Judge Murray in rejecting many of the counts, but ruled against both men on some charges of misrepresenting information to investors—Mr. Hopkins in a slide in a presentation, and Mr. Flannery in two letters. The commissioners ordered Mr. Hopkins to pay a $65,000 civil penalty and Mr. Flannery $6,500, and suspended both from the investment industry for a year. “They’re continuing to bully me,” Mr. Hopkins said. A spokesman for the SEC declined to comment on the case. Mr. Hopkins and Mr. Flannery now are asking a federal appellate court to reverse the SEC commissioners. That is a tall order, according to legal experts. “The appeals courts tend to go along with the SEC unless there’s an egregious error,” said Thomas Gorman, a former SEC attorney now at Dorsey & Whitney LLP. Supreme Court Justice Antonin Scalia said in November he was worried that deference to the SEC by federal appeal courts means the agency “can in effect create (and uncreate) new crimes at will, so long as they do not roam beyond ambiguities that the laws contain.” He made the remark in a statement, joined by Justice Clarence Thomas, during a criminal-case appeal. SEC officials said federal courts retain the final say. “I do not think that you are taking away from the courts the ability to shape the law,” Mr. Ceresney, the enforcement chief, said at a congressional hearing in March. The SEC added two new administrative law judges last year, bringing the number to five. The budget for their office has risen 44% this fiscal year to $2.5 million. Some are calling for formal constraints on the SEC’s growing use of its internal tribunal. The trend “has the appearance of the Commission looking to improve its chances of success,” said Michael Piwowar, a Republican SEC commissioner, at a February conference. He said the agency should create guidelines on its choice of courts “to avoid the perception that the Commission is taking its tougher cases to its in-house judges.” The SEC is considering such guidelines, said agency officials. A number of suits in recent months have challenged the SEC’s use of administrative law judges, arguing that the system is unconstitutional or unfairly denies defendants the same rights afforded by federal courts. The SEC’s Mr. Ceresney said the agency’s administrative proceedings “have procedural protections that are not available to defendants in district court proceedings.” The legal challenges have so far been unsuccessful. Lawyers say it could take years for courts to resolve the issues. SEC officials say that in addition to being fair, their in-house adjudication, with a 300-day deadline for many decisions, is much more efficient than using federal courts that can take years to resolve a case. It can still be expensive for defendants, though. 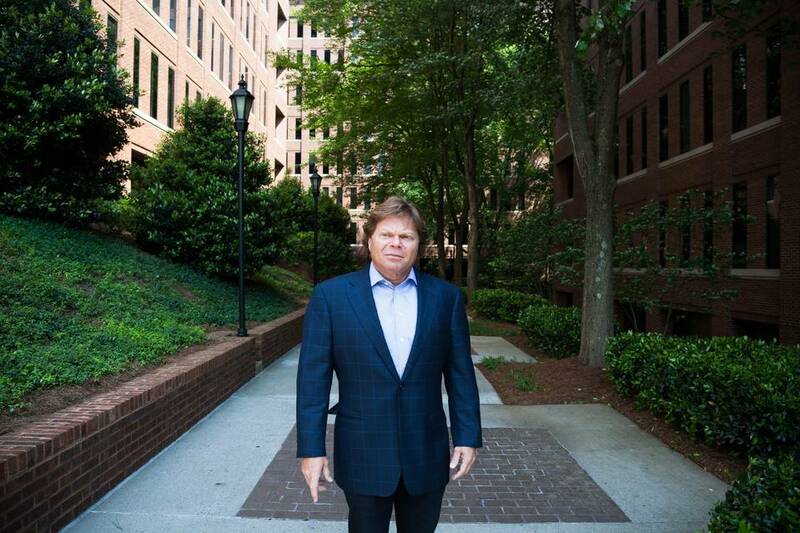 Mr. Shapiro, the Atlanta executive who lost before the SEC’s Judge Elliot and is appealing to the SEC commissioners, said he and fellow defendants have spent nearly $6 million on legal fees. In 2013, the SEC leveled charges against Timbervest LLC—a manager of timber-related investments of which Mr. Shapiro is CEO—as well as Mr. Shapiro and three other executives. The four were accused of defrauding a pension-fund client by making unauthorized asset sales and paying themselves more than a million dollars in undisclosed fees. After an eight-day hearing last year, Judge Elliot found against the executives on most of the charges and ordered them to pay sanctions totaling $1.9 million. He didn’t bar them from participating in the investment industry, saying the conduct had occurred outside the five-year statutory limit for such a penalty. The SEC enforcement staff is appealing that part of his decision, saying defendants’ “highly calculated schemes to defraud their client” warranted being barred from the industry. Timbervest, in its appeal, cited what it described as SEC Judge Elliot’s “record of utter deference” to the agency that employs him. The defendants also said the disputed transactions benefited clients and the fees were properly disclosed. The battle could be a long one. The SEC commissioners are due to hear the appeal on June 8. If they back the SEC judge, the defendants plan to ask a federal appellate court to step in, said Stephen Councill, a lawyer for the defendants. “We’re hellbent on fighting this all the way,” he said. Posted on May 7, 2015, in Postings. Bookmark the permalink. Leave a comment.